I had this funny image in my mind of the great Patriarchs singing together in a Barbershop Quartet. Moses laid down the law with his booming bass line. Isaiah crooned a warm baritone with smooth colorful chromatic harmonies. Noah soared over the top of the gang like his olive branch carrying dove. And of course, in the lead, was old Father Adam, aka, Michael. Hmm, not quite the Jackson 5, but maybe the Patriarchal 4. And both with Michael in the lead. Haha! Dr. Wolford’s hymn is a fine specimen. My favorite bits are the half stepping inner voice Barbershop bits. The first one is at the end of the second line in the tenor. 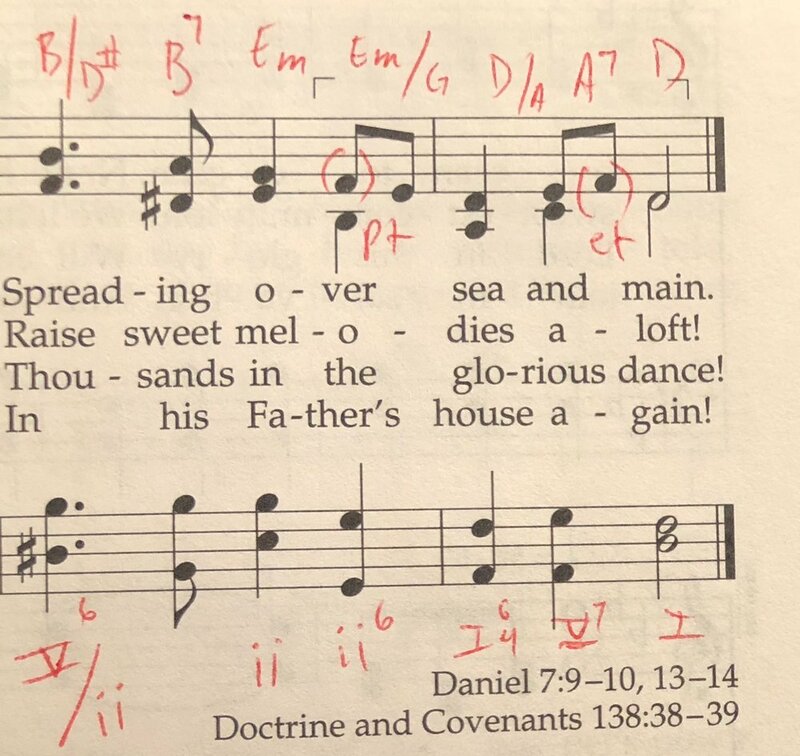 What a fun rising chromatic scale on “Minister before his feet.” It’s as if those who are coming to “minister” are a little nervous to approach. They make their way shyly up the chromatic scale. Then there’s the double chromatic sigh in the alto and bass in the 2nd bar of the last line. The alto steps down, A-G#-G-natural-F# and the bass follows along; F#-F-natural-E-D#. 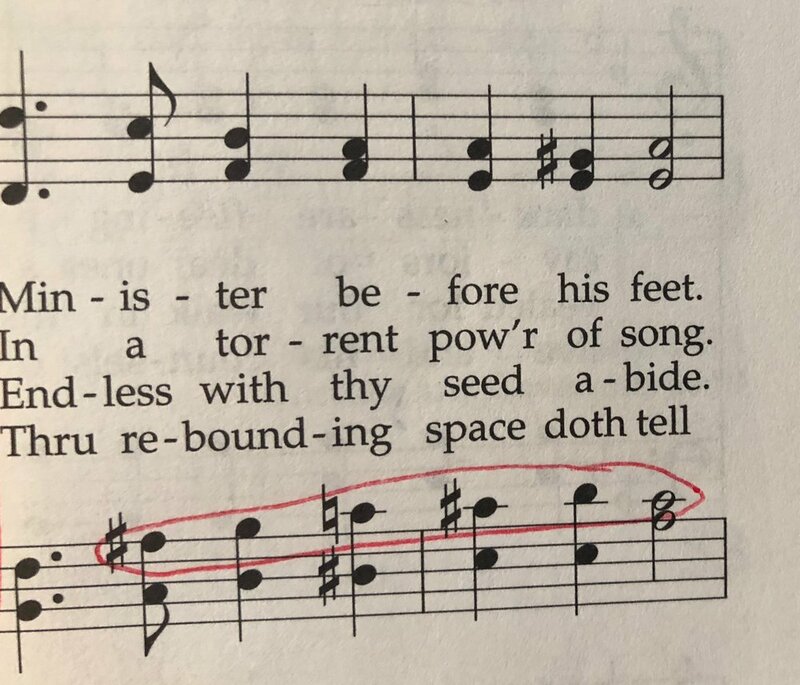 Unfortunately there are 3 illegal parallels in this hymn. #1 and #2 are identical. They occur in bar 2 and bar 6. The soprano and tenor move in parallel octaves from A down to F#. I love the sound of these chords in isolation, but from a horizontal perspective, moving from one to the next, the parallel octave gives of that naked sound that reminds me of a poorly constructed sentence. “I is today going to store.” Hmm, I understand what they mean, but it’s not quite right. Here are a couple possible solutions that keep the fine harmony in tact and smooth out the musical grammar. The 3rd illegal parallel is in the first bar of the last line between soprano and alto. This one is covered up really well, so I’m being a little fussy here. When there’s an “add-tone” chord in the parallel 5th or octave area, it’s usually not a problem. The “add-tone” (the 9th of the chord, for example) covers up the naked illegal parallel sound. Since the "-tri-” or “patriarch’s” is an A7 chord in 3rd inversion and with a 9th on it, the B, it’s covered up well. But there’s also a simple solution to the parallel 5th. Rather than taking the alto up to an “A” on “pa-”, if you take it down to an E making octave E’s between soprano and alto, the problem is solved and we haven’t sacrificed any of the colorful harmony. The final phrase of the hymn is quite nice. On the word “reign” in the last line, we have a five-seven chord with the E in the bass. Rather than resolve this 5 chord to the 1 chord, as is it’s natural tendency, it resolves to an altered 6 chord. This is pretty common and is called a “deceptive resolution,” 5 chord going to the 6 chord. But rather than use the diatonic 6 chord, the 6 chord that fits the key signature, Dr. Wolford turns it into a major 6 chord which we call a 5 of the 2 chord. The D# acts as “Ti” to the note E, which is the root of the 2 chord. So we have a deceptive resolution, but it’s a chromatic deceptive resolution because the D# is not in the key signature. And the inclusion of the D# in the bass completes the 4 step chromatic downward scale in the bass. Very nicely done. I’m sure Moses enjoyed singing that slithering bass line. But there was no need to hold up his staff (couldn’t help the inside Moses joke, sorry…). All in all, it’s a fine hymn. I hope we get to keep it. And I hope we’ll sing it more often. I don’t think I’ve ever heard it in Sacrament meeting. It’s funny that this keeps coming up. We hear people complain often about General Conference and how so many of the talks are similar teaching the same doctrines over and over. They want something new, something fresh. But when it comes to singing hymns, the want to stick to the same 20 or 30 hymns that are familiar to them. That doesn’t quite jive. If you’re looking for something new and fresh, try singing the 250-300 hymns you never sing. That will bring some newness to your worship experience. P.S. I’ve heard from a couple people that they are getting double copies of my daily blog reminder emails. I’m trying to figure this out. I’m not sure if they are isolated events or if I’ve done something stupid in my email service provide. If you’re getting duplicate emails from me, will you please respond and let me know? I want to get to the bottom of this. Thanks! In order to avoid a dirge tempo, one can completely disregard the suggested tempo marking here. I strongly believe the the tune can do a great job of communicating the tempo that best suits the melody and text, and I couldn’t imagine trying to sing this hymn at such a slow tempo. The tune speaks boldly at about 122 beats per minute, 30-40 beats faster than suggested. That’s a pretty big disparity and highlights the importance of becoming familiar with the tune and text and finding the tempo that really works. A strong principal chorus suits this hymn well.